﻿ Hotel Obokekyo Mannaka, Miyoshi-shi | FROM $125 - SAVE ON AGODA! "Location was fabulous, within walking distance to the boat r..."
Have a question for Hotel Obokekyo Mannaka? 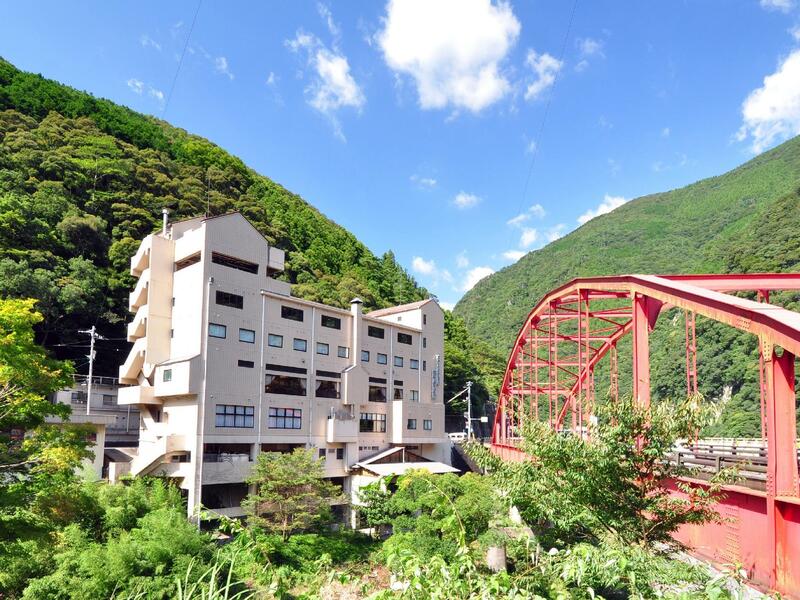 "This hotel is near the Oboke station & surrounded by beautiful nature." 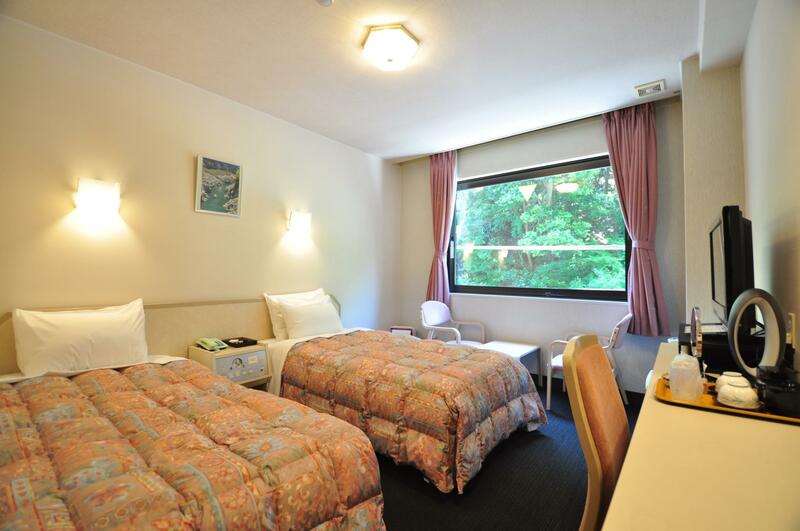 "Overall a good experience with this onsen hotel." "Location wise it's so convenient, the bus stop is just a few steps across the hotel." "Beautiful majestic view of the gorge!" If what you're looking for is a conveniently located hotel in Tokushima, look no further than Hotel Obokekyo Mannaka. The excitement of the city center is only 25 km away. With the city's main attractions such as Rest Area Oboke and Lapis Oboke, Oboke Yuransen, Oboke-kyo & Koboke-kyo within close reach, visitors to the hotel will just love its location. Hotel Obokekyo Mannaka offers impeccable service and all the essential amenities to invigorate travelers. This hotel offers numerous on-site facilities to satisfy even the most discerning guest. Guests can choose from 23 rooms, all of which exude an atmosphere of total peace and harmony. Throughout the day you can enjoy the relaxing atmosphere of the hot spring bath, steamroom. 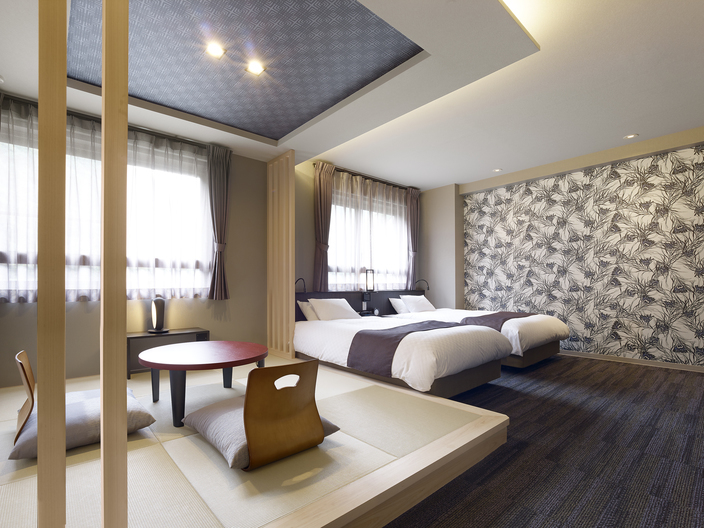 Hotel Obokekyo Mannaka is a smart choice for travelers to Tokushima, offering a relaxed and hassle-free stay every time. "The room was very clean and well equipped." Look beyond the external facade, this hotel is a gem. They bother to welcome you in every way, from having your name listed at the main entrance, to all the nice touches such as having your country flag at dining table and a paper crane folded using your country’s flag. Interns from Taiwan help with the communication and see to your every needs. Location was fabulous, within walking distance to the boat ride. The room has all the amenities that you need and more. This area in general somewhat rural so transportation has limitations. But the staff at the ryokan we're extremely helpful and friendly. They took me to/from the train station, helped me plan using the bus (or not using it when I was being over optimistic), let me borrow an umbrella and we're just all around fantastic. The food was delicious and the onsen was wonderful. Thank you so much for your comment. Your comment for us is very encourageous. All the staff in Hotel Mannaka are all welcome for your coming again. The hotel is the closest one from JR station, and hotel provides pickup service anytime, also staff is great - they can remember what I like to eat, and have Taiwanese staff to travslate. The hotspring at basement is wonderful too! 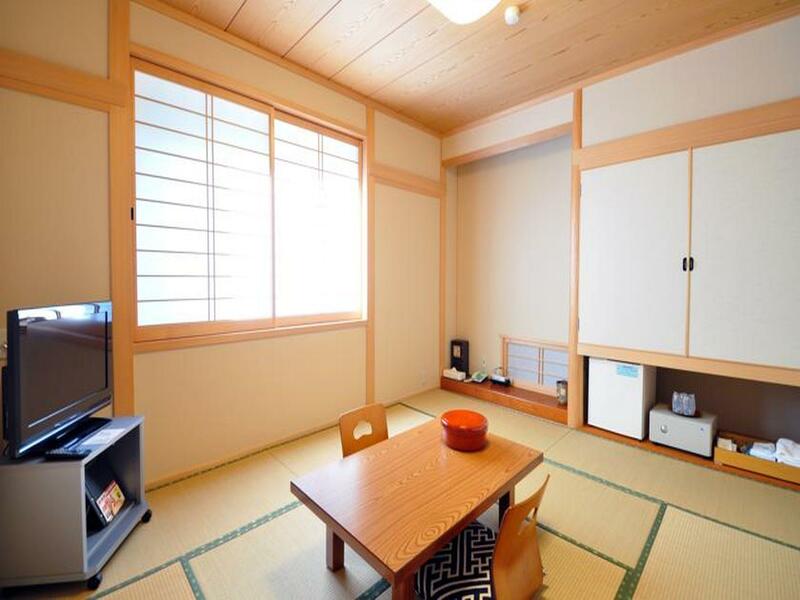 We reserved 2 Japanese style rooms: one with 3 adults and the smaller room with my kids aged 5 and 3. We felt welcomed when we entered the hotel because we saw our names on the bulletin board. The girl at the counter could speak mandarin so it was good. The room was very clean and well equipped. Upon arrival, I was communicating with the hotel staff that I was traveling with younger children and ordered one kids meal. So the hotel was very caring prepared some kids amenities such as kids hangers, a bigger garbage can in the toilet for diapers, 2 vests in case my children got cold at night, children’s slippers, kids toilet seat, and kids bathrobe for hot spring. The staff also explained to us what to pay attention in the room and hot spring before we entered our room. Dinner and breakfast were great! Good food and presentation. My two kids just shared one meal perfectly and they couldn’t even finish. Knowing that we were from Canada and Hong Kong, those flags were sitting on the dining table welcoming us. The only complain I have was the futon mattress. It was uncomfortable. I have had better ones before. And I think I could hear water dropping in the down pipe in the middle of the night because it was raining a bit. In general, the hotel was great situated right beside the beautiful river with friendly and helpful staff. Highly recommend to those with kids. They stay for free within an age range, unlike the other hotels. Staff are very friendly, and best customer service provided. Such as printed your country flag on the meal menu, very attentive. Cosy area for you to hang around with friend or reading. Dinner and breakfast were excellent ! Beautiful majestic view of the gorge! After the rain, the misty scenic view is so surreal. Location wise it's so convenient, the bus stop is just a few steps across the hotel. Staff makes you feel so welcome, with our country flag waving us welcome and when we check out. Food is superb too! A wonderful stay overall! Thank you for your coming our hotel when you traveled in Japan, and thank you for your love our meals,we wre so glad. Very friendly staff and onsen. Thank you for staying　and reviewing. And selecting us out of the many possible places here. The Management and Staff would like to thank you for the wonderful comments. We eagerly anticipate your next visit and look forward to serving you again. Sincerely. Hotel Mannaka From all of the staff. This hotel was small but located at a good place. I was able to walk to it from Oboke station (no luggage, only a backpack though) and it was near to the scenic valley cruise (operated by the same company I guess). Both the hotel and cruise emphasize on personalizing their welcomes to you. So from guide book, to name tag to welcome note to your dining table, you will always see your country flag. The Taiwanese seems to enjoy that very much, I'm not sure about others. I personally felt that it was overdone and that the welcome note on the room table was good enough. I'm here to immerse in a different country's culture, so I really don't need to be reminded of my country so many times. All else were great. I especially like it that they have some great amenities like a face steamer. Very helpful in the winter. The onsen was great. Esp the outdoor bath. Loved the dinner. Every dish tasted great. I'd recommend this hotel to my friends. Upgraded room, free parking, room clean and spacious. Mandarin speaking staff, guest name written on the board as you enter the hotel. It was raining when we checked out, staff holds umbrella and assist us as we go to the car, bid goodbye as we left. Superb service and facilities. Would definitely visit here again next time. Thank you for your coming. We were glad to serve you when you stayed to our hotel. Good location, very convenient to nearby scenery spots. Food and spa were good. Very polite and helpful staff. This hotel is near the Oboke station & surrounded by beautiful nature. The Yoshinogawa river is just too magnificent to forget. Travelers need to have car to navigate the nearby attraction like Karazu suspension bridge. What surprise me though is the personal touch of the staff of the hotel. They have Chinese speaking interns from taiwan's Kao Yuan university. They print singapore flag logo on the dinner & breakfast menu. They fold a paper crane with Singapore flag on it, they displayed singapore flag before we left. I bet they did the same to all other visitors from all over the world. Hotel is old but pretty well maintained for guest facilities. I really think this hotel has lots of element for success. Overall a good experience with this onsen hotel. Staff polite, patient and helpful. Location next to gorgeous views. Meals, both breakfast and dinner, just delicious. Hotel attends to every detail. Thank you for your coming our hotel, we were glad to served you when you traveled in Janpan. Loved the place would go back for some days. Thank you for your loved MANNAKA HOTEL. If you traveling in Japan again,we will look forward to your coming our hotel. Wonderful experience, value for money stay with good cuisine and excellent staff, there are English-speaking and Putonghua-speaking staff which is unexpected in this part of Japan! Great hospitality, abundant of delicious foods. Very impressive on the hospitality, food, polite stuff and the unique way of welcoming the guests. It is highly recommended to stay at this hotel. Thank you for staying our hotel. We are implessed by your message. We always make comfortable place for guest. We will try our best to make more good service(Omotenashi) for guest. Hope see you again our hotel. Thank you. The food is great. staff serve us with professional manner. Great food, staff are so helpful & location is good in a beautiful area.